We spent our final three weeks in Spain with a fantastic family in Málaga province that needed Workaway help to get their rental property ready for their summer guests. This meant that we had our own private apartment to stay in (which would be rented out in the coming months) whilst we helped them with painting, gardening and land clearing. It would probably be too much to term it ‘work’ as we had such a good time there it felt more like we were on holiday ourselves. The nearest centre of civilisation was a tiny village called Salinas, which is about 1km from the property, while the nearest town – Archidona – was around a 15 minute drive. Archidona is a bustling place with churches, bars and shops as well as a wonderful viewpoint from the Sanctuary of the Virgen de Gracia located on a hill overlooking the town. Our first week was a rainy one which meant we found ourselves mostly confined to the apartment; by no means a bad thing as we had plenty of movies, food and games with the kids to pass the time! 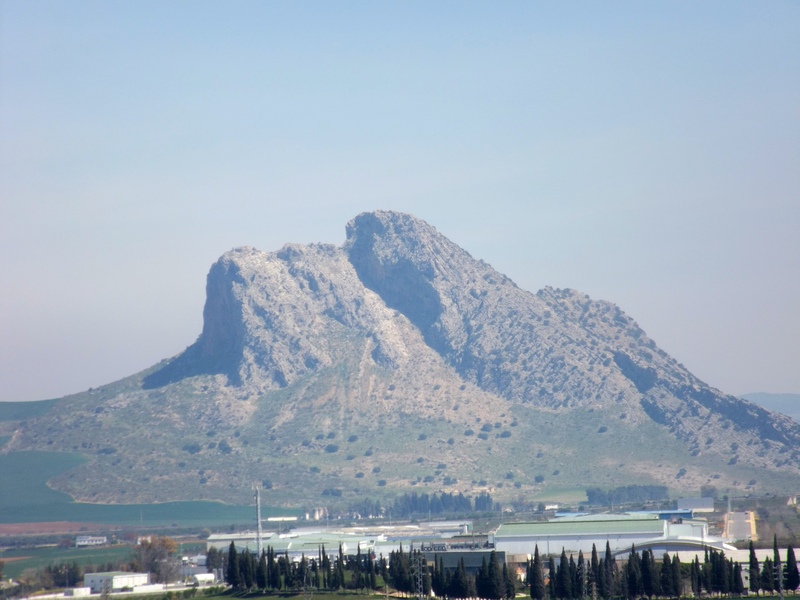 However, once the rain cleared and the sun reappeared, we decided to head out one weekend to a city called Antequera which is roughly 20km away from where we were staying. 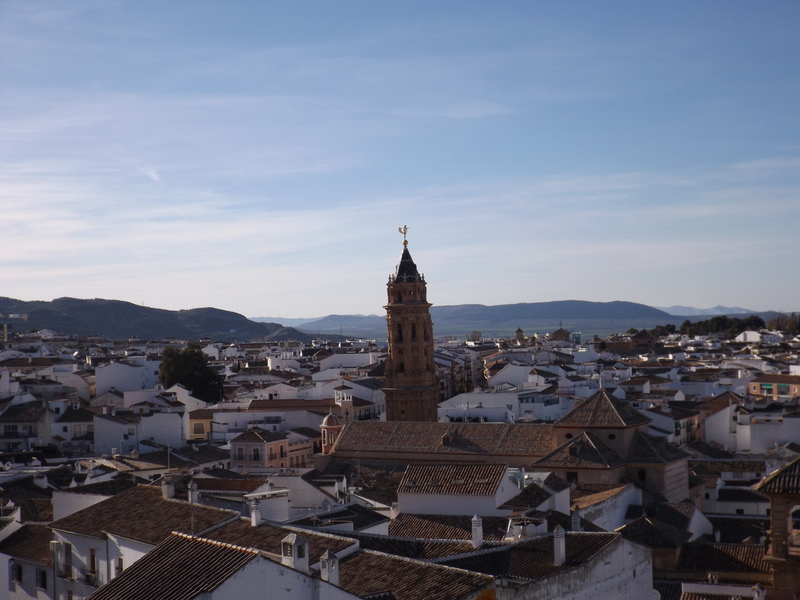 Antequera has around 20 churches and convents, the spirals of which jut out high above the houses in the town and create a beautiful vista when you view it from the vantage point near the old castle. 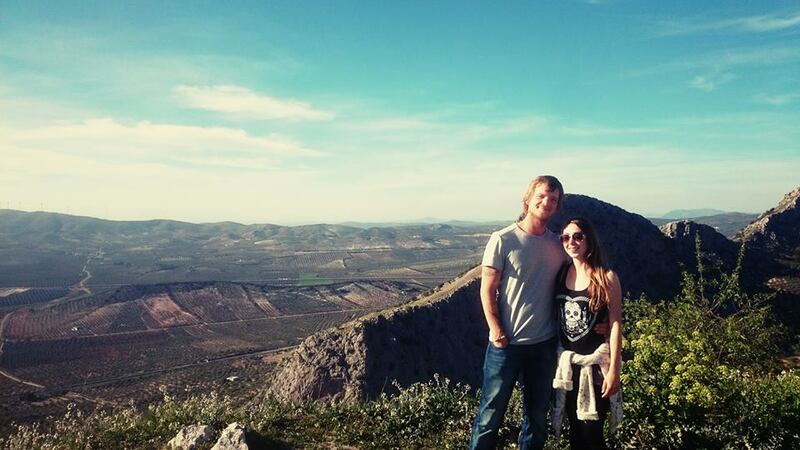 An unusual rock formation, called the Peña de los Enamorados (the Lover’s Leap), though also known for its striking resemblance of a sleeping man, is close to the town and also adds to the lovely view. The castle itself (the Alcazaba) was built in the 13th century and apparently has very nicely maintained gardens, but unfortunately it is not open on weekend afternoons so Phil and I missed the chance to go inside. Another church close to the Alcazaba is the Real Colegiata de Santa Maria Church, built in the 16th century. 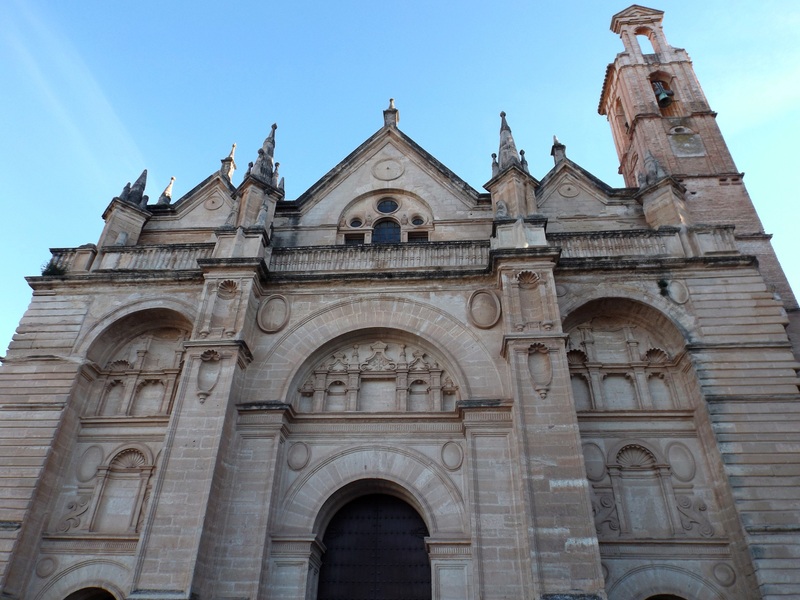 Of course, churches are common sights in Spanish towns and cities (particularly in Antequera! ), but this one is particularly striking for its hybrid Rennaisance-Gothic style, as well as its strategic location high on the hill from where you can enjoy another pretty view onto the town below. Aside from the multitude of religious establishments, Antequera is also notable for its very well preserved Bronze Age dolmens, two of which lie just on the outskirts of the town. The larger of the two, Dólmen de Menga, is around 25 metres in length and 4 metres high. When a team of archaeologists examined the site in the 19th century they found the skeletons of several hundred people inside. Together, it and the nearby Dólmen de Viera are the largest burial mounds from this time that can be found in Europe. The area itself is spacious and full of wild flowers and herbs which provide both a lovely smell and a lovely sight as you leisurely walk to and between the caves. If you fancied going further afield, there is a third Dolmen (Dólmen de Romeral) which was built later, in the 2nd millennium BC further outside of the city. Another sight which I would recommended highly is the main museum in Antequera; El Museo de Ciudad de Antequera. The entry is free on Sundays although it would certainly be worth the modest entry fee if you were to visit on a different day of the week. The Rough Guide to Andalucía which we borrowed from Diana spared only a brief paragraph to the museum, where it praised the building itself but hastily dismissed the collection as essentially a waste of space. I find myself trusting guide books less and less, and I’m glad we paid no attention to the critical write-up: the museum has an impressive collection of artefacts – many very well preserved – spanning prehistory, proto-history and Roman times. One particularly notable treasure is the first century bronze Roman sculpture of Adonis which was discovered in a farmhouse in 1955. The museum chronicles life in the local area, with insightful titbits of information on how and where people lived. Particular emphasis was given to funeral rights and relics, which provided a helpful basis of knowledge for later visiting the dolmens. There were also a number of rooms dedicated to two local contemporary artists, José María Fernández and Cristóbal Toral. The latter’s paintings often featured solitary individuals and/or luggage – whether his intention was to highlight immigration to or from Spain I’m not sure, but they were fascinating to look at; with my limited knowledge of art movements, they seemed to either be in the style of romantic realism or hyper-realism. Fernández’s work on the other hand was quite varied, with a broad range of paintings and sketches, often with a morbid or sexual twist. One thing that the guide book did seem to get right, however, was its critique of the food in Antequera; there are plenty of fast food shops – kebabs, oddly enough, seem to be rather popular – but most of the restaurants seem to provide only standard raciones (often without the option of the smaller tapas), with just a few distinguishable local specialties. The guide book did state that there are a handful of genuinely good tapas bars, and I’m sure if you have long enough to search them out then you’d find some decent places for lunch or dinner, but sadly we weren’t quite so lucky. Two places I must point out though, as they restored my faith in Antequera’s food (anyone who knows me well will know that my mood is impacted heavily by good or bad food!) are a recently built Pick-A-Pizza, and a delightful little patisserie called Entre Torres – both of which can be found along the main high street. The Pick-A-Pizza was a last resort after exhausting all of the other restaurant options in the nearby area, but it turned out to be cheap and very cheerful: in the chaos of their second day in operation, the staff accidentally forgot one of Phil’s slices of pizza, and they apologised by giving him a free beer – the lady in charge who’d been friendly and polite when we ordered even came directly to our table to apologise for the mix-up which was totally unnecessary but very endearing. The bakery, Entre Torres, had an excellent selection of cakes and pastries as well as ice cream, and provided probably the most exciting coffee I’d had during my three months in Spain: a delicious cappuccino served with a straw in a tall glass half of which was dominated by cream. I ordered that and a croissant for my breakfast, and was amused to see that, as well as butter, I was provided with a ‘light’ version of peach marmalade, as though a diet version of jam might in some way counter-act the excessive amount of fat and sugar that made up my morning meal! Our final week with Diana and Shaun was blissfully hot and sunny, and on our second to last day we all took a trip to a nearby lake, Iznájar, tucked into the southernmost part of Córdoba province. Phil and the kids were a bit braver than I was and spent a lot longer swimming in the lake: a brief splash about was sufficient for me as it was pretty damn cold in there. It was also a slightly cloudier day than usual, meaning that I was even less careful than usual with the suntan lotion and I’m not too proud to say that I did end up leaving Spain with a pretty serious sunburn. The following day our hosts very kindly took us to Málaga airport for our flight to Rome, but not before Phil and I quickly booked return flights to Spain in June: after three fantastic months in the country we could only bear to say goodbye if we knew we’d soon be returning! As always thanks for reading – more blogs from Italy to come soon!